I've been working on this new rabbit character model recently. We actually have a couple of other character models already complete, but they rely on technology that David hasn't had time to implement in the engine yet. I haven't shown them off on the blog because they still need our fancy fur and clothing(!) systems. However, we are going to try really hard to make a playable build ready for the rapidly approaching Independent Games Festival. With the submission deadline looming we have decided to go with lower-tech characters for now, and see how they look in the engine. Later on, I'd like to do a comparison of this model with the fancier existing ones. 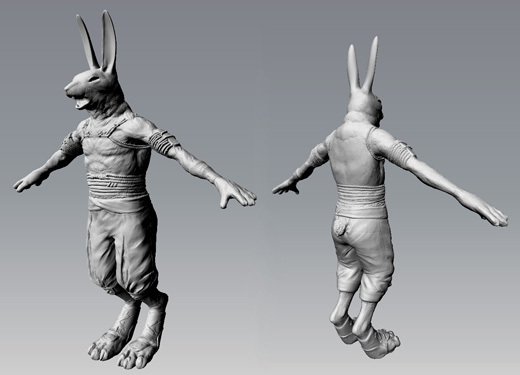 This is a more traditional style for normal mapped character, with the fur and clothes sculpted right on it. What do you guys think of it so far?